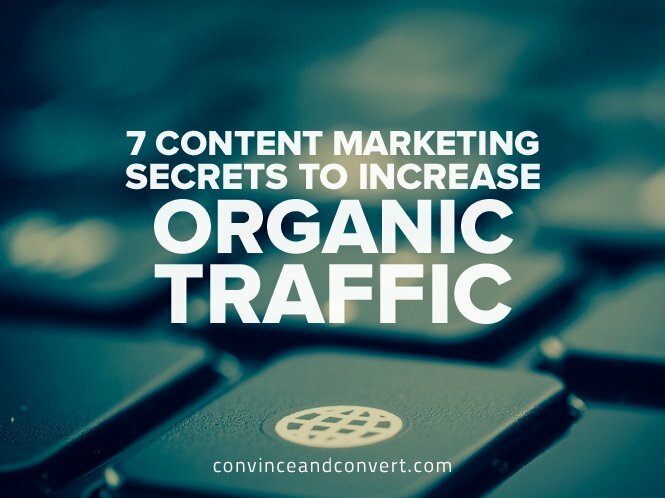 Here’s a question for you: How effective is your content at driving traffic to your website? If your answer is “not very,” then this is the post for you. Even if your content is performing well, there’s always room for improvement. But contrary to popular belief, this doesn’t require a new blog post every other day. As a matter of fact, you can drastically boost your website’s SEO traffic growth with just a single blog post. This probably sounds too good to be true. 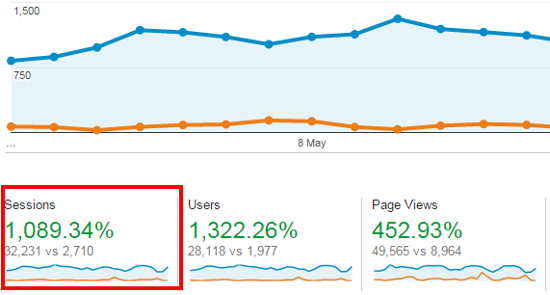 That’s why today we’re going to share with you the exact steps and secrets we used to increase traffic growth for a site by a staggering 1089%. It’s true: links are what make the world (wide web) go ‘round. But you can’t build long lasting links without quality content to link to. When we say quality content, we aren’t talking hastily-written, 100-word blog posts, either. Instead, we’re talking go-to, epic content that stands head and shoulders above your competition. While creating this content may sound daunting, the following steps will ensure you’re creating viral, epic content in no time. It’s a fact: the effective use of keywords forms the basis of any high-ranking site. The same philosophy applies when you’re creating epic content, too. In fact, ensuring your content is built around keywords that are highly relevant to your business is the most important step of all. Epic content doesn’t just increase your business’s standing as a go-to expert within your industry. It also provides one of the most effective link building opportunities available. That’s because content that provides worthwhile, meaningful, lengthy information on a subject is far more likely to be read and shared. So when it comes time to build these links, you want to ensure you’re boosting your relevancy—and rankings—for the lucrative keywords that your site is hoping to rank for. Use tools such as Google Keyword Planner or KeywordTool.io to find highly searched, relevant keywords. These will often be the primary keywords your site is already targeting. You can use these to inform the topics for your epic content. Long tail keywords are the perfect way to structure the body of your content. Use these exact long tail phrases as headings and subheadings, and you’ll further boost your keyword usage and ensure you’ve covering the topics users are searching for. All great content starts with an idea. But how can you be sure your ideas are the right fit for your business, website, or audience? With topic validation. Sure, you probably have the keywords required to write the content. But researching the right topic that utilizes these effectively is another matter entirely. By using tools like Buzzsumo (seen above), Alltop, Quora, and even Google Trends to research and validate your topic before you start writing, you’ll ensure you’re not just creating content for content’s sake. And most importantly, can you create something better? The easiest way to answer these questions is to scope out the competition. By researching existing content, you won’t just have a bar to measure your own content against, but you’ll also uncover exactly what your epic content needs to include to beat the competition and become the go-to resource. Tip: While competitors’ content is a useful research tool, it’s crucial that you ensure your epic content is entirely unique. To avoid any issues, run your content through SEO crawlers such as OnCrawl, which alerts you to any duplicate or near-duplicate content issues. Keywords? Check! A valid topic? Check! A bar to beat? Check! You’re now ready to put digital pen to virtual paper and write your epic content. While the stakes may feel higher, doing so is no different than creating any other piece of content. You’ll just be creating it on a much grander scale. As ever, you should aim to include as many content marketing enhancements as you can. These ensure you’re maximizing your content’s shareability and guaranteeing your epic content stands head and shoulders above the rest. A killer visual asset is far more than just window dressing. It actually provides even more opportunities to build links to your site. Lengthy content is great. There’s no doubt about it. But a wall of text? Ain’t nobody got time for that! By introducing visual elements, you’ll enhance the shareability and memorability of your content—great qualities on their own—as well as open your content up to a larger userbase, especially when you consider 65% of people are visual learners! But make no mistake: any old visual element won’t do. Instead, we’re looking for something much better than that: a killer visual asset. Research the topic, data, and content that will make up your diagram or infographic. Follow infographic design best practices, and create an infographic of your own by using a free tool like Venngage. Do you lack design experience? Then use services like Design Crowd or Crowdspring to recruit talented artists to create a stunning diagram or infographic for you. With your content created, you’re all set to put a few staple content marketing techniques into action—techniques that can build those lucrative, long-lasting backlinks any site would love to have. Social networks, new bands, and fashion trends all have something in common: they all come and go. And as they do, links to those sites become broken. If you consider the hundreds if not thousands of links on any given site, it’s easy to see how these broken links go unnoticed. Sites like these that could use a helping hand—from you! But why would a site add a link because you asked them to? Because by opening communication not with a pitch, but an offer to help, the suggestion that they include your link becomes less a soulless pitch and more a reciprocal gesture of goodwill. If you scratch my broken link back, I’ll scratch yours. Here’s how. Tip: Mix and match your keywords. While a search for “accounting” may work fine, terms like “business” will also offer a wealth of suitable prospects. 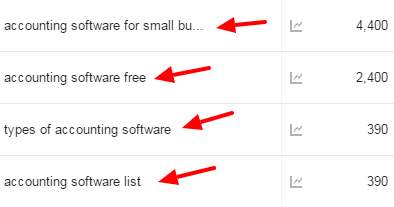 From these results, compile a list of relevant sites that feature a page of links. 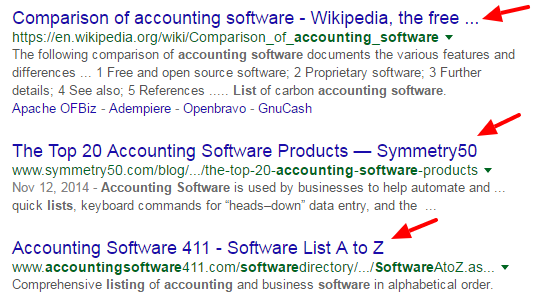 Tip: Use the Scraper Google Chrome plugin to quickly gather the search results from a page. Check each site to ensure they’re relevant and of sufficient quality. Be aware that any older sites you find during Broken Link Building will be an affront to the eyes, but this doesn’t mean they’re bad. In fact, you’ll be surprised how many of these are still regularly updated. Better still? Older, established sites can provide higher link value. With a list of sites in hand, it’s time to don the detective’s hat and go looking for those broken links. Open one of the Links pages that you compiled during your search. 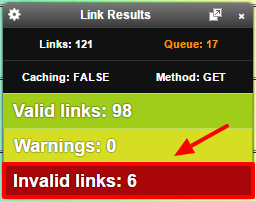 Use a tool like Check My Links or Broken Link Checker to scan the page for broken links. Make a note of any links that are broken. Check the site for a contact name and email address. It’s come time to contact these site owners and inform them of the bad news: their site includes broken links. Then, follow it up with the good news: you know which ones! But your initial outreach shouldn’t include the list of broken links. By sending a site a list of their broken links, you close down any need for further communication. Sure, you might get a quick thank-you, but what you really want is the chance to mention your content. I was looking for some info on [KEYWORD], and found a few broken links on your site which I wanted to tell you about. Do you still keep this page updated? If so, let me know and I’d be happy to forward the short list of broken links over to you. It informs the site owner that there their site contains broken links, which is a helpful act on your part. It doesn’t mention which links are broken, which in turn invites the site owner to reply! I was searching for information on [KEYWORD] when I stumbled on them. I hope this helps! Perhaps it might make for a nice addition to your page? Just a thought! In any case, keep up the great work with your website and resources. Guest posting is one of the most effective ways to build your brand, promote your expertise, and drive targeted traffic to your site—not to mention its ability to build quality, long-lasting backlinks to your epic content. Here’s a mini-guide to guest posting, broken down into three simple steps. Use the following search terms to find websites that have hosted Guest Posts before. The idea here is if they’ve accepted them in the past, then there’s a good chance they’ll be interested in your ideas. Found the perfect blog? Pitch them your idea! When pitching, ensure you suggest ideas that provide them with something useful—that is, unique content ideas that fit the site’s target audience. Once you’ve gotten the green light, put digital pen to virtual paper and write your guest post. Make sure you include links to relevant internal and external content, as well as an all-important author bio. Now’s your chance to wield your visual asset like a link-building weapon. By reaching out to relevant sites, you can draw attention to your new visual asset and establish long-lasting backlinks in the process—backlinks that you wouldn’t have been able to land any other way. Visual link building begins just like any other kind of link building: by finding sites that write on topics relevant to your visual asset. To do this, open Google and enter keywords that relate to your visual asset. Found a relevant site? It’s time to make contact! But rather than run in shouting the virtues of your visual asset, look to open a channel of communication by focusing on their site, their content, and a small mention of your visual asset. I was recently searching for some info on [KEYWORD], and found [SITE NAME]. I really liked your posts on [KEYWORD RELEVANT SUBJECT]. Particularly [POST NAME] : [SOMETHING POSITIVE ABOUT THEIR POST]. On that note, I recently put together a [DIAGRAM OR INFOGRAPHIC] on [KEYWORD]. Given you write a lot about [KEYWORD], I thought you might be interested. Not only does this email strike up a conversation, but it also brings attention to your visual asset without sounding like a salesperson. Your visual asset might be great in its own right, but by adding further incentives for a prospective site owner, you’ll increase your chances of landing a link. A mini-guest post that features your visual asset. A short write-up to accompany your infographic. A write-up of the information or steps displayed in your diagram. Thanks [NAME]! You can find the [DIAGRAM OR INFOGRAPHIC] on our site here: [LINK]. If you were thinking of adding it to your site, I’d love to write up a unique [CONTENT TYPE] to accompany the [DIAGRAM OR INFOGRAPHIC] that would be tailored to suit your site and its audience. By doing so, you’ll increase the chances of successfully landing a contextual link, which provides a far greater benefit for your site than regular embedded links that accompany most visual content. Now You Know the Secrets, So Get Creating! So there you have it: our secrets, tips, and tricks for boosting SEO traffic growth and driving a wealth of new visitors to your site. With these skills now a part of your marketing repertoire, there’s nothing stopping you from emulating our outstanding results, if not surpassing them. Whether it’s a lengthy piece of epic content, a killer visual asset, or a bit of both, by ensuring that whatever you create is the best-of-the-best, you’ll provide your site with the best chance of achieving maximum results and landing quality, lucrative backlinks that will stand the test of time. Robert Kramers, owner of Found SEO, is a passionate New Zealand-based search engine and content marketer. Like what you read? Subscribe to his newsletter by downloading his SEO e-book.